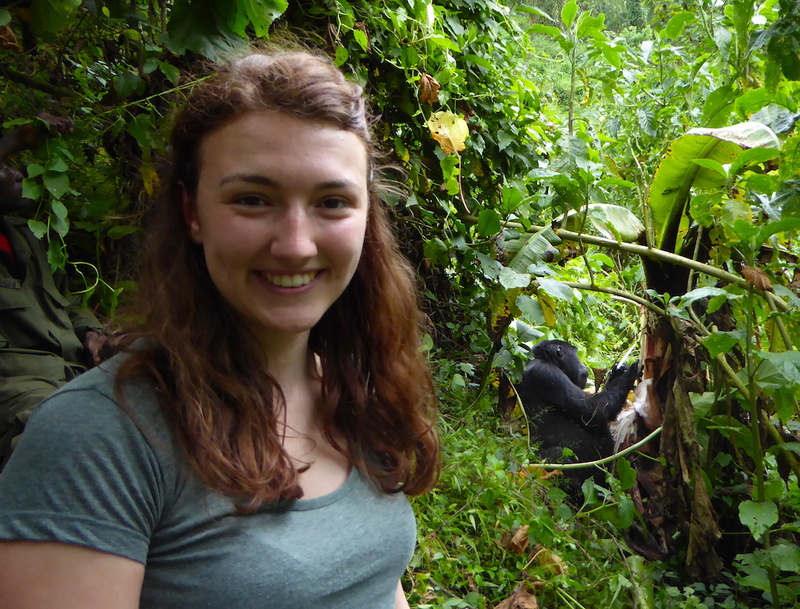 The Gorilla Trek is a 4-day walking and boating trip organised by Edirisa for East African Playgrounds volunteers. 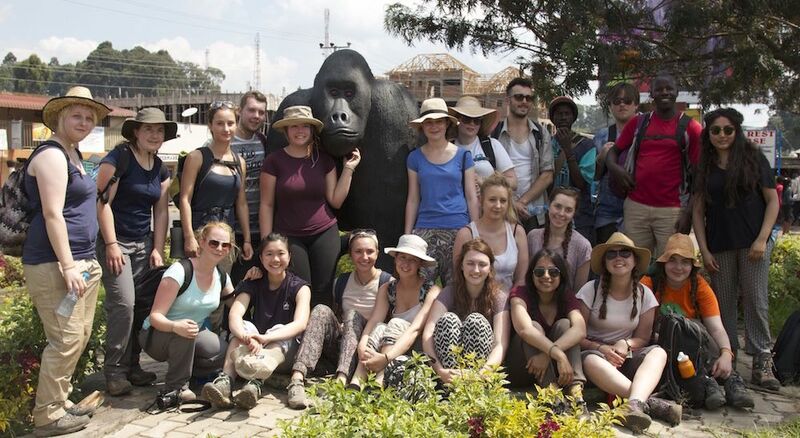 Participants from different British universities trek from Lake Bunyonyi to Rushaga and then visit mountain gorillas there. We will wake up before 7am, to be ready and packed before breakfast at 8am. 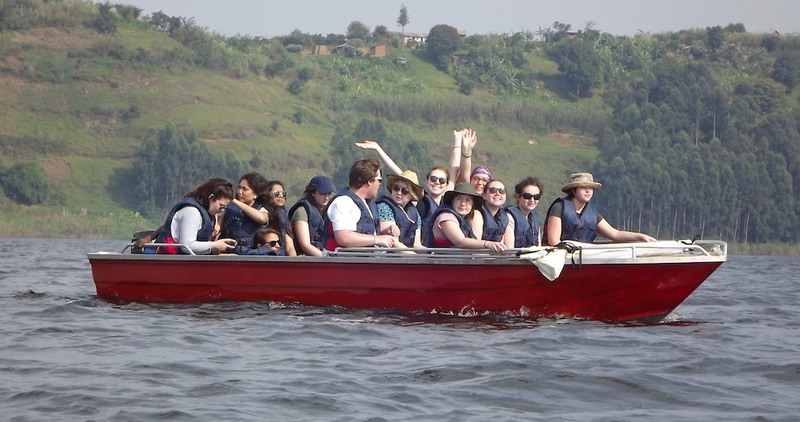 You will canoe to Kyabahinga peninsula where most of today's program is happening. 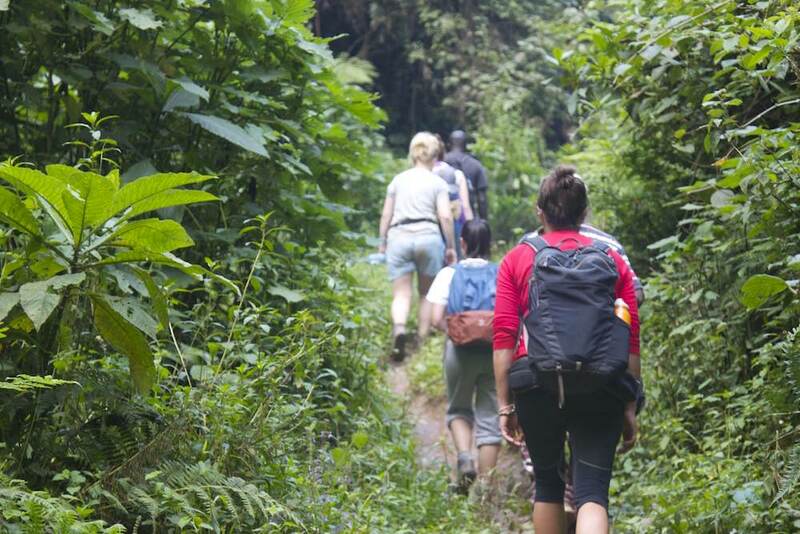 A steep climb that takes about 30 minutes will be the sole physical challenge of Day 1. 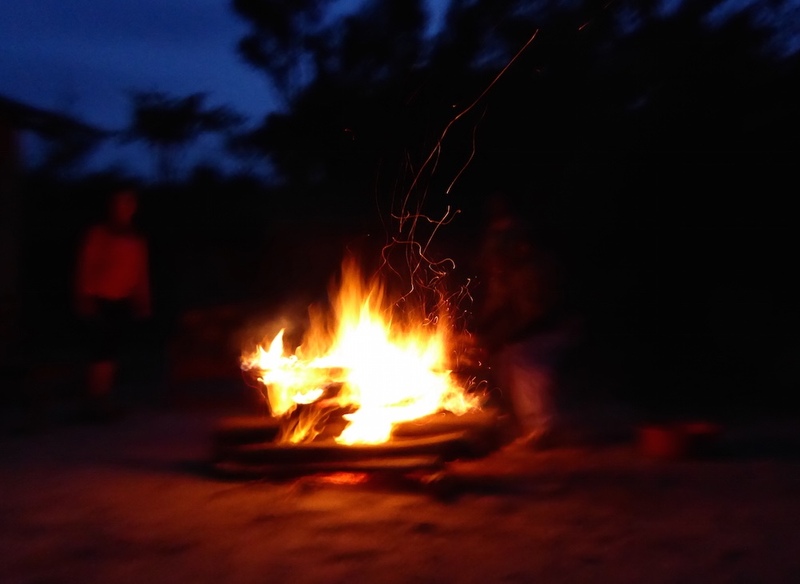 What would you ask a herbalist to help you with? 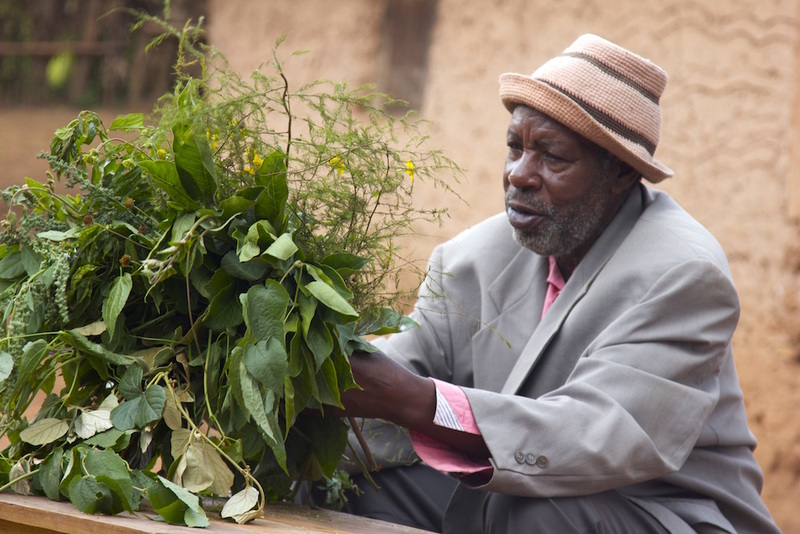 Omugurusi Jemeriah knows everything there is to know about medicinal plants, and a session with him is the next item on our program. 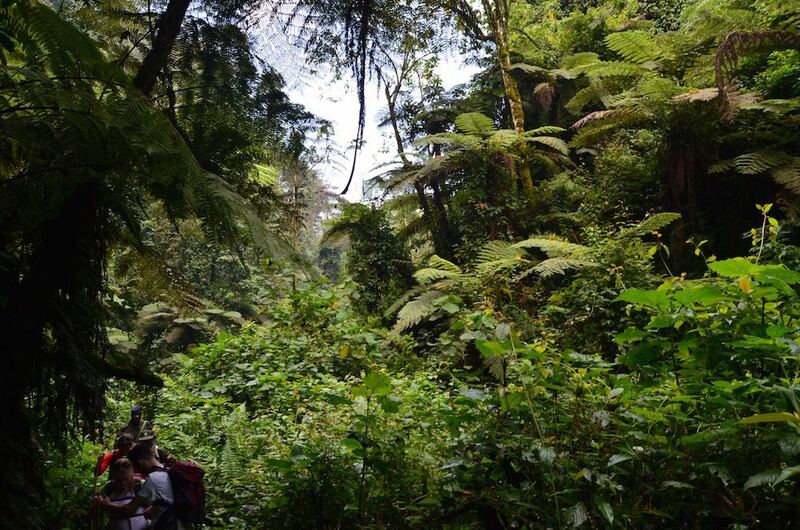 Only a short walk away lies the African Explorer Cultural Village, a source of stories about the history and beliefs of the Bakiga people. 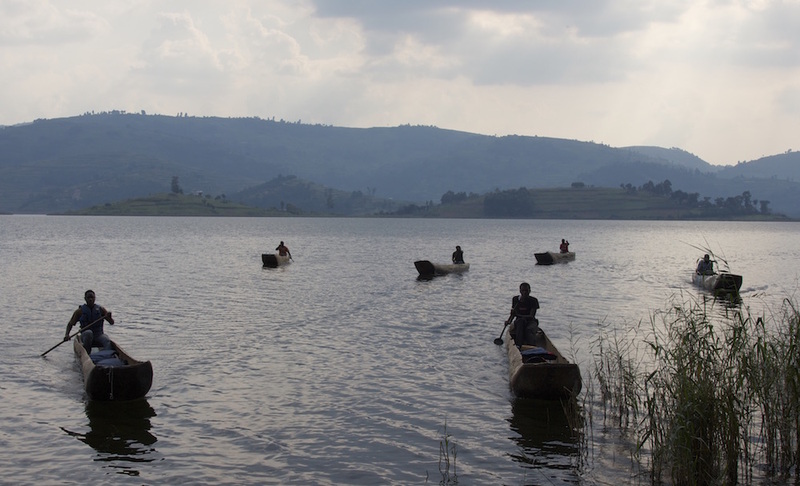 From the ridge of the peninsula you will enjoy sweeping Lake Bunyonyi vistas, towards the north and the south of the lake. 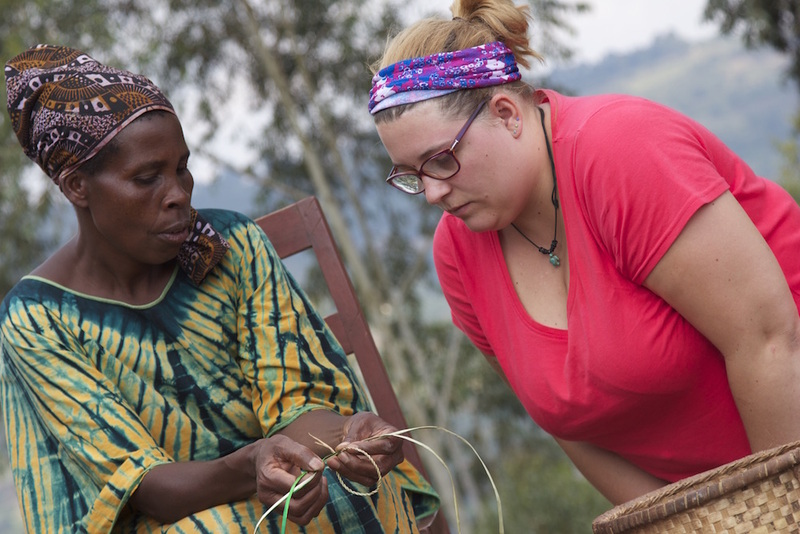 At Mrs Anna's we will eat lunch (beans, sweet and Irish potatoes, ground nuts and dodo, local spinach) and get an introduction to craft making. This is the toughest day of the trek! 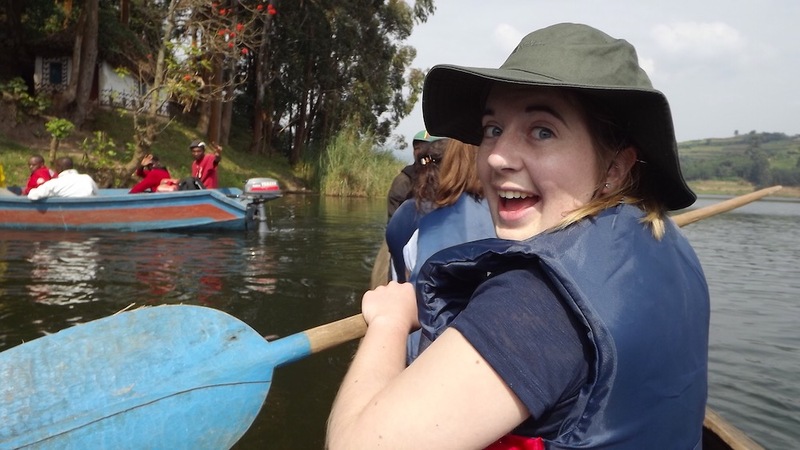 We will get up at 6am, in the middle of Lake Bunyonyi, with the goal to reach Lake Kayumbu on the other side of Echuya Forest Reserve before the night falls. 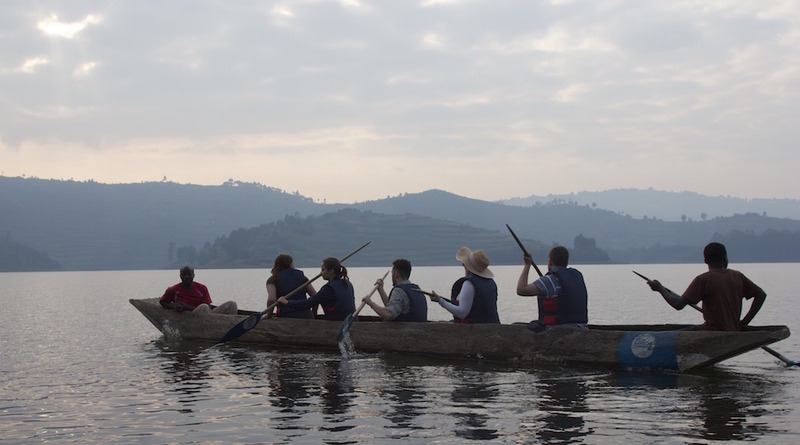 Traditional dugout canoes will take us to the western shore of Bunyonyi. 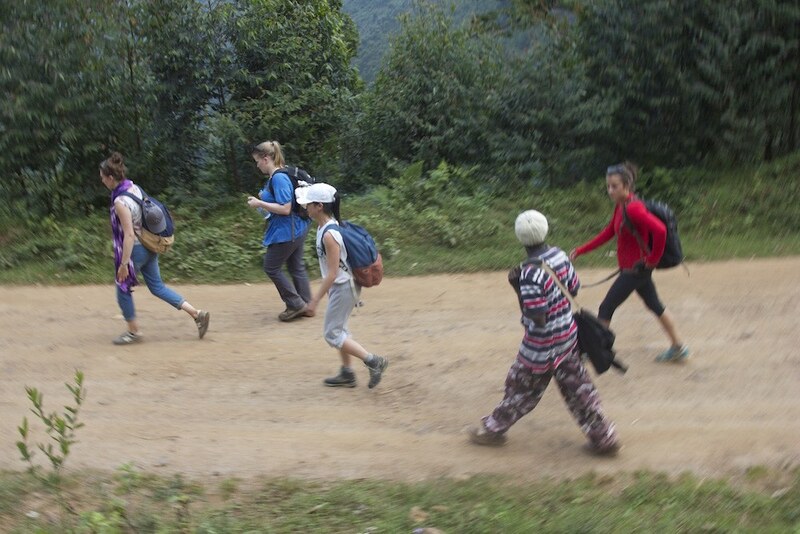 25 Bazungu (white people) hiking = prime attraction in regions that seldom see tourists! 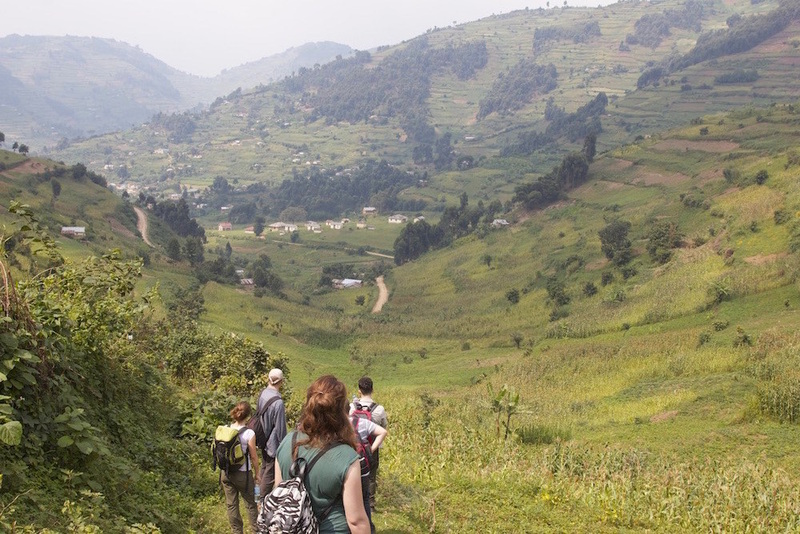 A multi-hour climb will lead you past the subcounty centre of Bufundi. Depending on how quick we are, we will have a rich picnic lunch before or after Echuya. 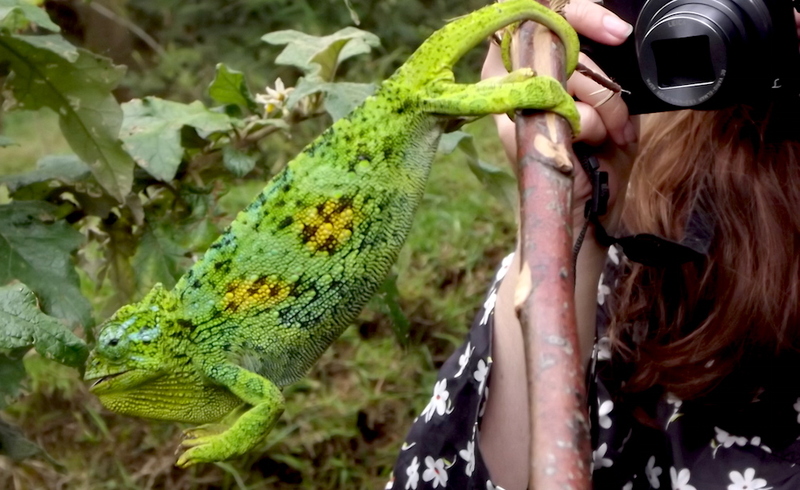 Right at the start of the 2-hour Echuya crossing, impressive chameleons are quite often found. 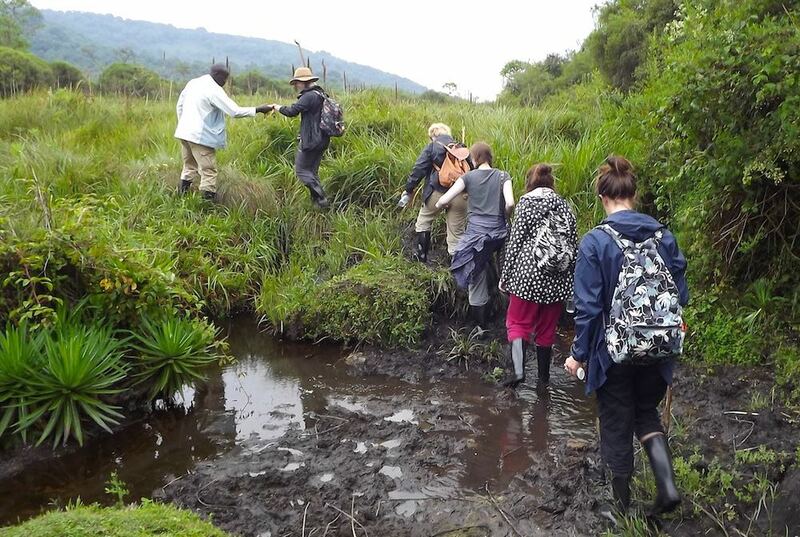 The swamp in the middle of the forest calls for gumboots (that travel there on a porter's head) and some focus. 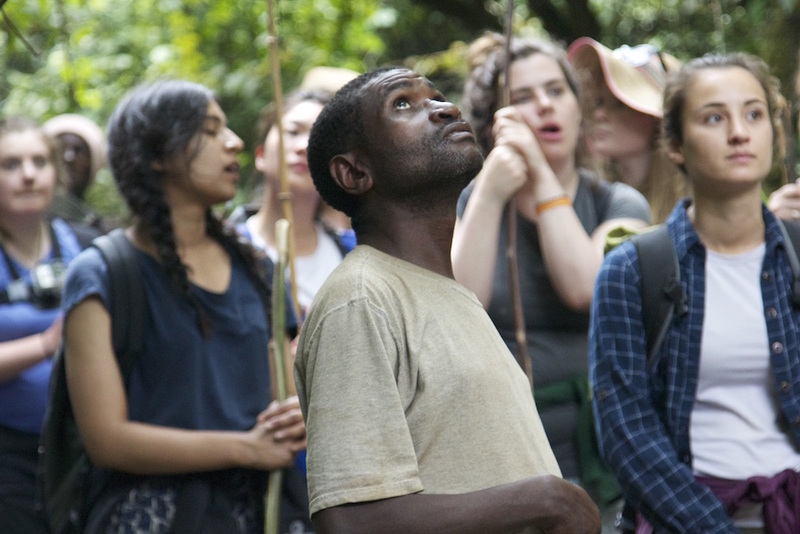 Throughout the reserve you learn interesting things from our guide Kanusu, the leader of a nearby Batwa Pygmy community. 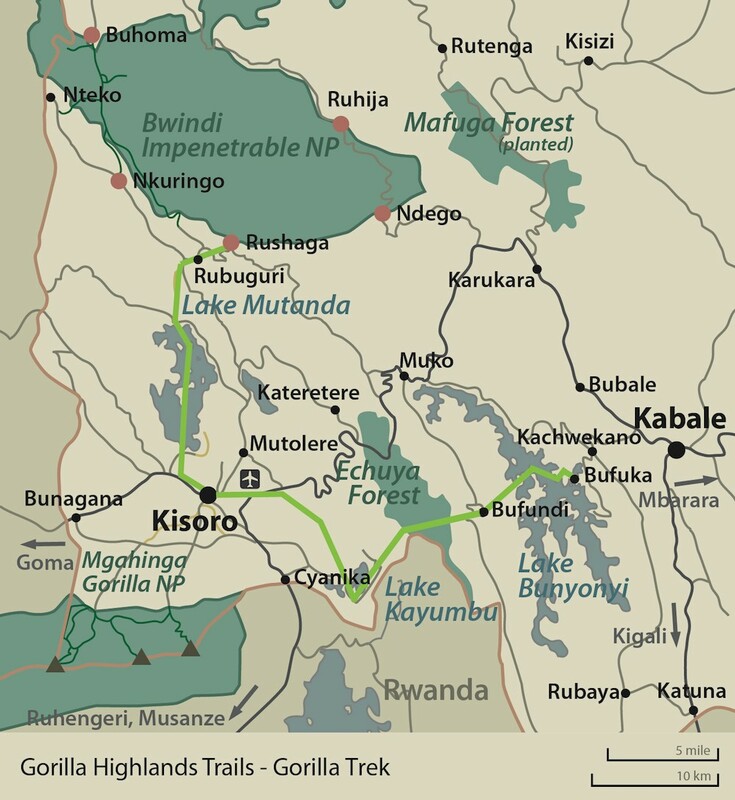 Another three hours will be needed to reach Lake Kayumbu and camp at a Church of Uganda compound on the lake shore. 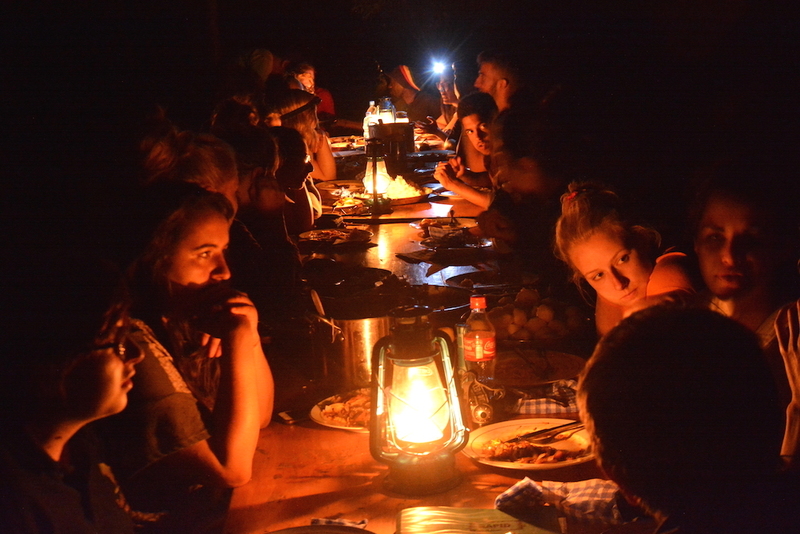 Local dinner will be cooked for us by the lay leader’s family. 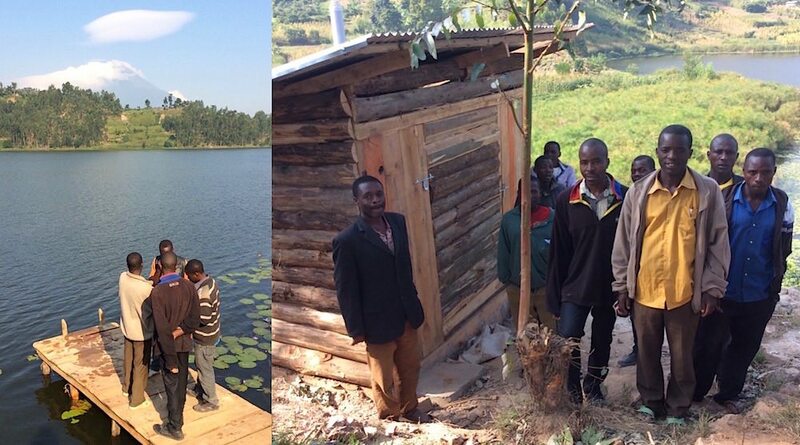 Simple sitting toilets and swimming docks have been built for Gorilla Trekkers at all overnight locations. 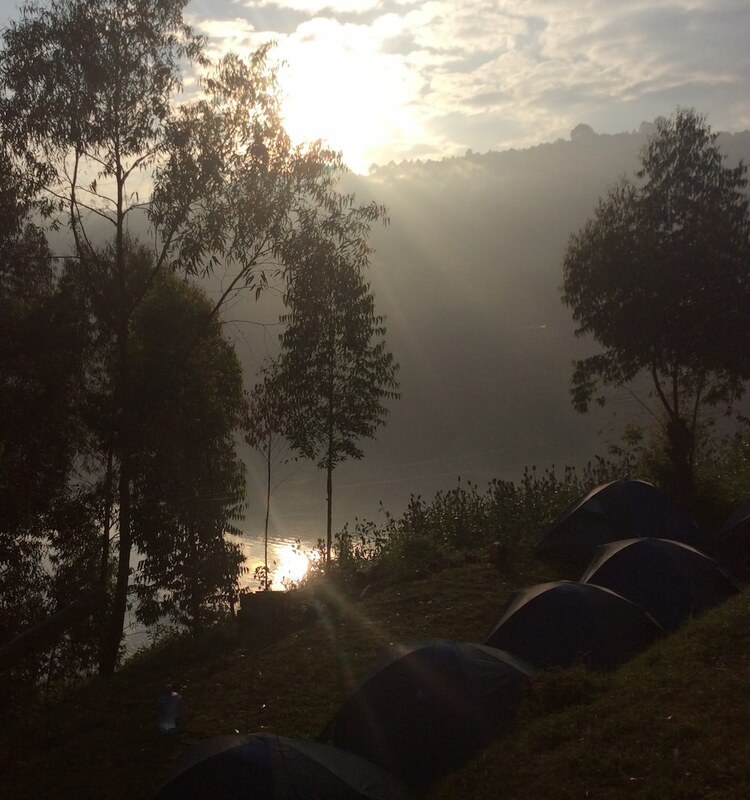 What about a refreshing morning swim with a dormant volcano, Mt Muhavura (13,500ft) on the horizon? 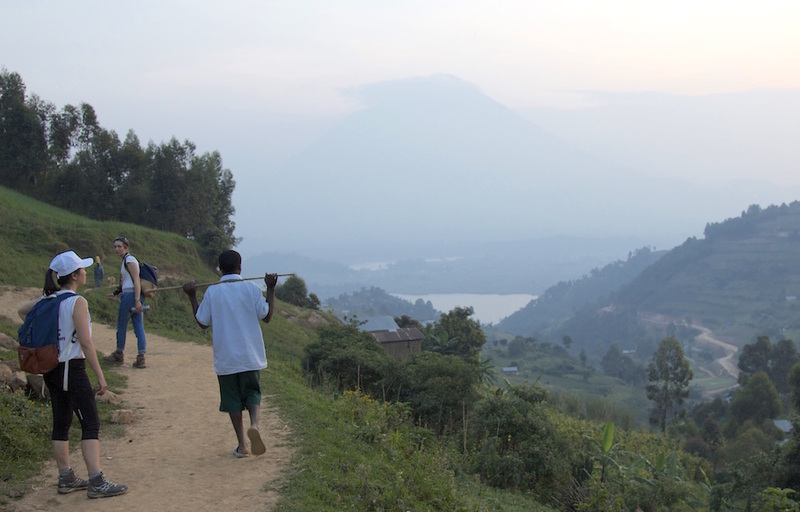 After 8am breakfast you will hike towards Kisoro Town, a predominantly flat affair. 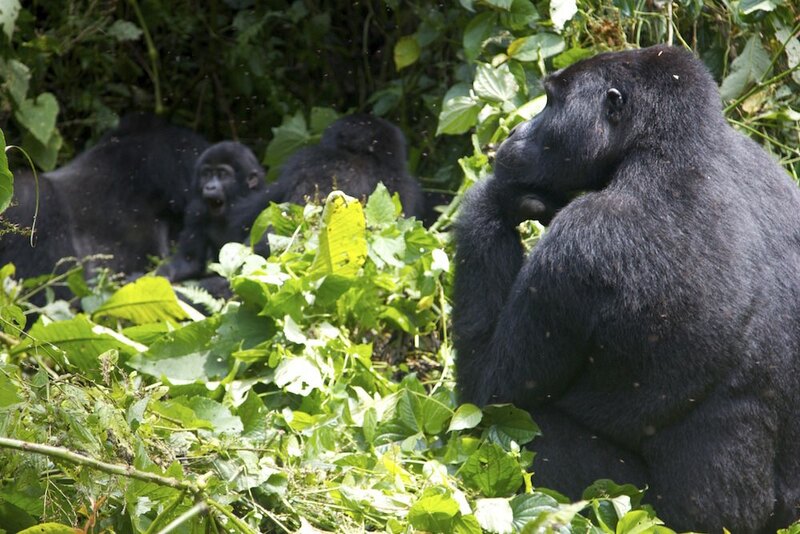 There you will practise with the gorilla statue a little (you want to be ready, right?) 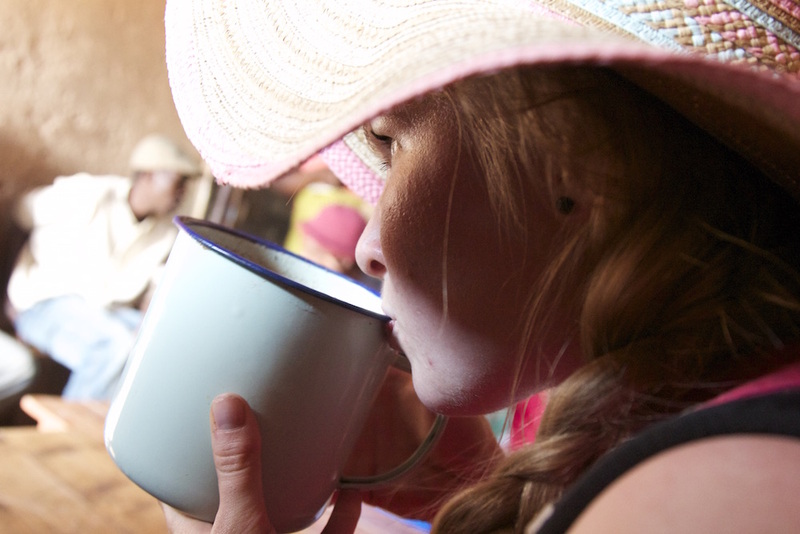 and eat tasty lunch at Coffee Pot, a cosy place established by a German lady who has lived in Uganda for decades. 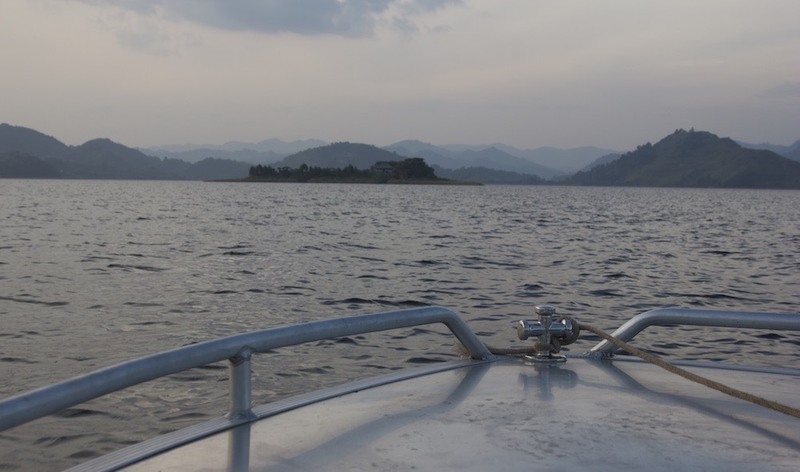 We will make it to other side of the lake by motorboat, in about an hour and a half. At around midday there will be a tasty meal served at the lodge, as we wish to continue soon. 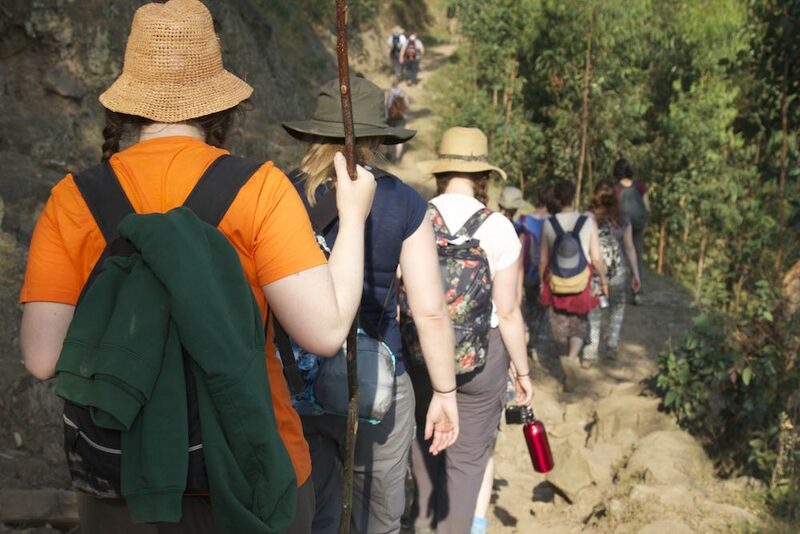 The last part of the trek includes 15 energetic climbing minutes, while the rest is really easy to walk. 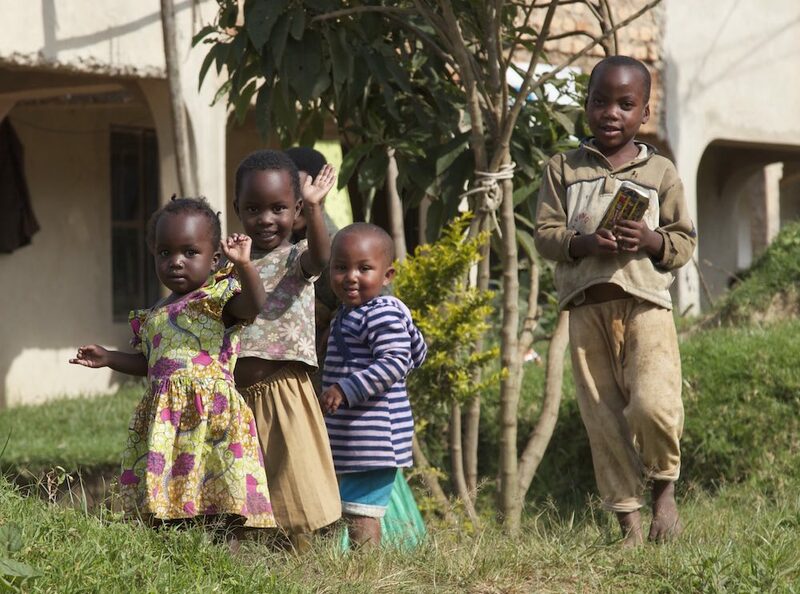 Kids were be happy to see you in Rubuguri Town! 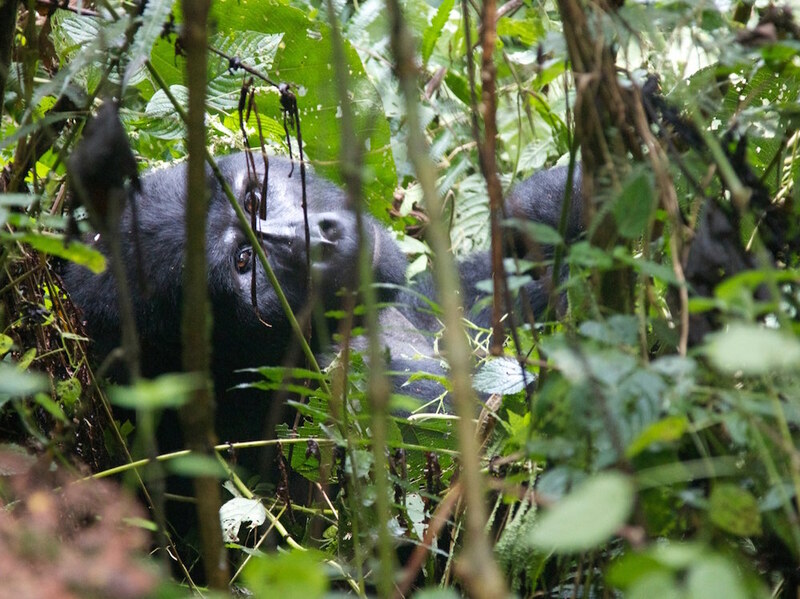 The final few minutes we will hike on the edge of Bwindi Impenetrable National Park. No need to say anything, right?